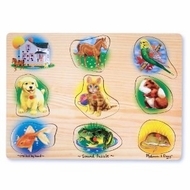 This Pet Sounds Peg Puzzle is a twist on the classic puzzle. Sounds are played when the puzzle pieces are properly placed on the board. It's a fun and unique way to reinforce cause-and-effect, early vocabulary and matching skills. Measures 9" x 12". Requires 2 "AAA" batteries (not included).